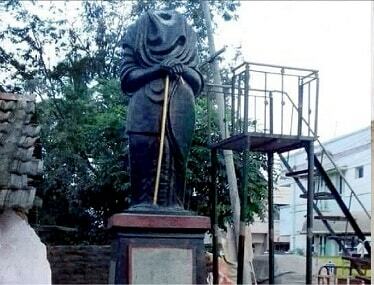 Pudukottai: A life-size statue of rationalist leader and Dravidian movement founder EV Ramasamy, popularly known as Periyar, was found vandalised at Aranthangi in the district Monday, police said. Local leaders of the Dravidar Kazhagam noticed the damage caused to the statue Monday morning and informed police, demanding that the culprits be arrested immediately. Officials said steps were being taken to repair the statue. DMK president MK Stalin condemned the desecration of the statue. "Not only should stern action be taken against whoever be the destructive forces which acted with the intention to disturb peace during election time but they should be crushed with an iron fist," he said in a tweet.